The B&W LUT pack comes with 60 desaturated film-inspired CUBE LUT files. Inspired by vintage and contemporary black and white films, FCPX LUT: B&W can instantly make give any footage a classic look. From vintage looks, to contemporary fashion and everything inbetween, with 60 different desaturated color gradings to choose from, you can make your project look anywhere from hipster to dramatic in the click of a mouse. CUBE LUT files are extremely versatile. They can be used in many different softwares. 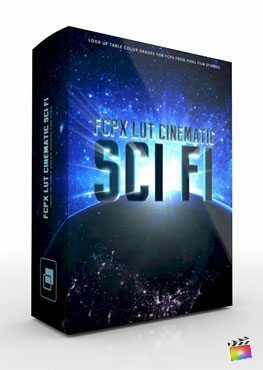 With the FCPX LUT B&W Loader from Pixel Film Studios, editors can quickly and easily load a LUT file directly into Final Cut Pro X to color correct or grade their footage without having to use another software. Users can simply drop the loader on top of their footage and then, use the drop down menu to select or import a CUBE file. If the LUT doesn’t fully achieve the desired look, editors can use the built-in customization controls in the FCPX LUT B&W Loader to adjust the strength, contrast, brightness and saturation of their image. They can also make further adjustments to color of the lights, darks, and mids. FCPX LUT Black & White will be located in the effects library. The effects library is located in the bottom right of the Final Cut Pro X application window. If you have done any updates to your computer, this may happen. An easy way to fix this is to perform a clean install on the plugin. Here is how to do this. You will need to a full uninstall first: Go to this directory: Macintosh HD>Library>Plug-Ins>FxPlug>FCPXLUTLOADER.fxplug Delete this file and empty the trash. Then, go to this directory: Movies > Motion Templates > Effects Delete the "Pixel Film Studios - FCPX LUT LOADER" folder Empty the trash can. Then run all the necessary installers again.